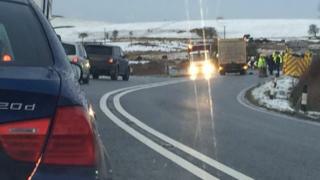 A fire engine left the road at the scene of a crash in "severe ice conditions" on the A75. The accident, involving two lorries and a car, was reported at about 08:30 between Stranraer and Newton Stewart. The Scottish Fire and Rescue Service said it sent two vehicles to the scene but one ended up coming to rest at the side of the road. The firefighters were unhurt. Two casualties in the other vehicles were taken to hospital for checks. Conditions in the area prompted Scotland Transerv to issue a freezing rain warning urging motorists to show "extreme caution". The road was closed west of Kirkcowan shortly after 09:00 but it had fully reopened by 12:00.